We’ve rounded up our favourite first birthday designs for Gruffalo birthday bakes below. The story of the Gruffalo is enchanting for any child, of any age, making it a brilliant first birthday party idea for your baby. With so many vibrant characters, the possibilities are endless when it comes to organising a get-together that your family and friends will remember. If you don’t know the magical story of the Gruffalo, you can read it here. Looking for something other than a Gruffalo get-together? Here’s our whole list of first birthday party themes. 1. Gruffalo and friends cake. Personally, we love this idea for a Gruffalo cake. It includes fondant icing models of the Gruffalo, the mouse, the owl, the snake and the fox, all set in the deep, dark, wood – lovely. This gorgeous Gruffalo birthday cake comes complete with fondant icing characters and can be personalised with your child’s age and name. It will definitely look the part on the party table with the ‘terrible tusks’ and ‘poisonous wart’ on the end of his nose. These mouse and Gruffalo cupcakes are super adorable! They’re really fun and effortless to make, too. Full instructions, ingredients, hints and tips on how to bake them can be found here – all of your guests will love munching on them. Have a go at baking your own simple Gruffalo cake like this one. Even if you have never tried anything like this before, it looks quite straightforward. 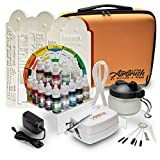 We’re sure your friends and family will be really impressed. Thinking about what to serve your guests at the Gruffalo gathering? Look no further than our first birthday food and drinks post. This Gruffalo cake is a true masterpiece. With its amazing design, your guests are sure to be impressed. 7. Number one Gruffalo cake. This chocolate sponge cake in the shape of a number one is filled with buttercream grass and topped with edible Gruffalo characters. A great idea that you could try yourself. This mouse bake is another straightforward recipe to try at home. Whip up a Victoria Sponge and use one layer as the face and the other as an ear, then cover with butter icing for ‘fur’. You can add eyes and whiskers, too. It’s a piece of cake! 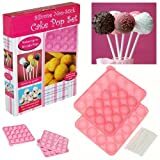 A fuss-free alternative to a large traditional birthday cakes, these cake pops can be given out as individual cakes to you guests when leaving, without you having to spend time cutting up slices. Each guest can choose their favourite character. Source: Elaine’s Cake Pop Bakery. 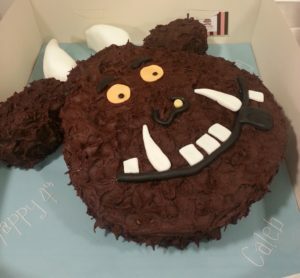 We think this is the most amazing Gruffalo cake we’ve ever seen! It is so detailed and just looks like the main character himself; with his ‘terrible tusks, and terrible claws, and terrible teeth in his terrible jaws’. What else are you going to stuff in your Gruffalo goodie bags? We have a heap of ideas for Gruffalo party favours.